Can I take Gluco-Solve before breakfast? How should I start taking Gluco-Solve? Take 1 capsule 2 times daily before meals. Not to exceed 2 capsules per day. When should I test my post-meal blood sugar level? One of the most important times to test your blood sugar level comes 30-45 minutes after you eat. This 30 to 45 minute “window” is when your body is digesting many of the carbohydrates and sugars from the foods you’ve eaten. Testing your blood sugar during this time will often show a significant “spike”–or higher elevation–than fasting levels and other time points such as two hours after meal. Occasionally I like to treat myself to some carbohydrates like bread or pastas. If I take some Gluco-Solve prior to eating them, will it help? Yes. Taking Gluco-Solve before a carbohydrate treat will help reduce the blood sugar elevation after. Since taking Gluco-Solve, I feel less hungry and more energetic. Is this expected? Yes. The ingredients in Gluco-Solve promote normal blood sugar levels, helping you feel less hungry and more energetic. If Gluco-Solve makes me less hungry, should I skip meals? Should I take Gluco-Solve everyday? Yes. The nutritional support from Gluco-Solve diminishes if you take less than the recommended daily amount, because the ingredients cannot be stored by your body. 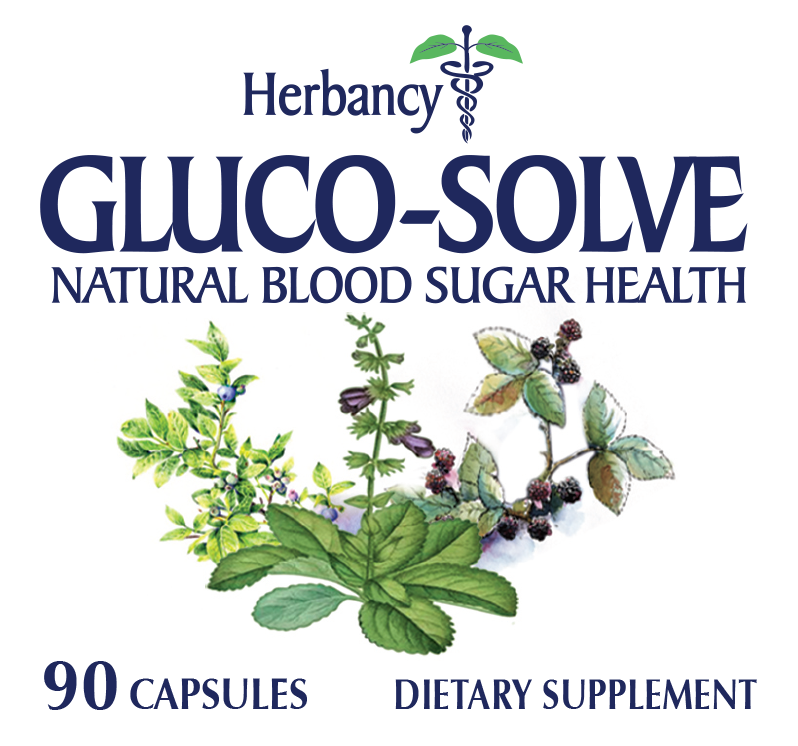 And unlike a drug, a natural supplement requires time to do its work: Gluco-Solve will immediately begin helping manage your blood sugar levels, but allow your intestines, liver, and cells the time to put this increased support to full use. Is it important to exercise and watch what I eat while taking Gluco-Solve? Physicians typically recommend moderating what you eat and moving your body more, and Gluco-Solve can help you stick with your diet and exercise program. Other members of my family are concerned about their blood sugar. Should I suggest they take Gluco-Solve? Gluco-Solve can be used by people who are overweight and concerned about their blood sugar. Of course, they should first consult a physician. Is Gluco-Solve free of corn, dairy, egg, starch, yeast, barley, rye, wheat, or other gluten? Is Gluco-Solve free of artificial flavors, preservatives, colors, sodium, stimulants, and sugar? Have the ingredients in Gluco-Solve been studied? Yes. The ingredients in Gluco-Solve are supported by numerous studies and trails: 14 on chromium yeast, 8 on cinnamon bark powder, 6 on gymnema sylvestre, dozens on aloe powder, 4 on bitter melon, 8 on fenu greek, 12 on milk thistle, dozens on cinnamon, 6 on beet root, 4 on bamboo shoot, dozens on ginger root, dozens on blueberry, dozens on kale, dozens on sage, dozens on garlic, and dozens on acacia berry. Because it’s not a drug, Gluco-Solve is regulated by the FDA as a dietary supplement. Does Gluco-Solve require a prescription? Does Gluco-Solve have any side-effects? One of the 3 ways that Gluco-Solve promotes normal blood sugar levels is by reducing the absorption of carbohydrates in food. Unabsorbed carbohydrates (especially if one eats too many of them), can give some minor discomfort (bloating, gas constipation, loose stools) before being expelled from the body. However, the majority of people don’t experience discomfort, especially if they’re watching their carbohydrate consumption. People who have discomfort but stick with Gluco-Solve for a couple of weeks find that it usually goes away. And as with any natural supplement, if you experience heartburn or acid reflux, rather than take Gluco-Solve before or during your meals, you might try taking Gluco-Solve right after your meals. Yes. Gluco-Solve is manufactured in a Good Manufacturing Practices (GMP) facility in the USA, audited and registered in compliance with NSF/ANSI Standard 173-2008, Dietary Supplements, Section 8. These requirements are consistent with the published GMP regulation for dietary supplements as defined in 21 CFR § 111, which was published by the FDA in May 2007. Gluco-Solve is proudly made in the USA. Yes. Gluco-Solve meets all disintegration standards and is designed to be efficiently absorbed. Does Herbancy Research & Development offer expedited delivery? Yes. You may choose your shipping options when placing your order. What payment methods does Herbancy Research & Development accept? We accept the following payment methods: Visa, MasterCard, American Express, Discover. For your added convenience, we also accept PayPal . Yes. All orders through Glucosolve.com are secured by GoDaddy, the leading Internet security provider, with an SSL 256-bit encrypted order form. An SSL (Secure Sockets Layer) certificate is a digital certificate that authenticates the identity of a website and encrypts information sent to the server using SSL technology. Encryption is the process of scrambling data into an undecipherable format that can only be returned to a readable format with the proper decryption key. How can I be sure my order has been received and shipped? Your package will arrive according to the shipping method chosen when you place your order. Does Herbancy Research & Development accept International orders? What do I do if there is a shipping or delivery error? Should you experience any problems with your order, please contact Herbancy Research & Development Customer Service immediately, so that we may correct it in a timely matter. Every supply of Gluco-Solve comes with our 30-day Money Back Guarantee. If Gluco-Solve does not meet your expectations, you can return it within 30 days of the order date for a full refund of the product price. To return Gluco-Solve, you must first call us at 1- 877- 836- 8351 or email: RMA@herbancy.com, and you will be given a Return Merchandise Authorization (RMA) number. To receive your refund, you must postmark your return within 35 days of the order date. Be sure to clearly write the return merchandise authorization (RMA) number on the outside of the box. Our shipping department is NOT allowed to accept any packages without an RMA number. After the shipping department receives your return, it generally takes your bank 3-5 business days or less to process your refund. You may qualify for reimbursement if you have a Flexible Spending Account (FSA) and your healthcare practitioner provides a written directive for Gluco-Solve. With your order, Herbancy Research & Development provides a receipt, which should be submitted along with an FSA claim form. Check with your FSA Administrator or Human Resources department. I’m a healthcare practitioner, and I would like more information about Gluco-Solve. Whom should I contact? Whom do I contact about wholesale or retail distribution of Gluco-Solve? Don’t see the answer to your question? Ask Here……. Refer your friends to Gluco-Solve and earn $10.90 from every sale! Gluco-Solve values the support of our customers. You are our brand ambassadors and partners. We want to thank you by sharing the revenue we earn from each customer you refer to Gluco-Solve who buy’s Gluco-Solve using your referral link. Ready to be a partner? Sign up and get started today! Become a Gluco-Solve Ambassador Today! when can I place an order for this product? I have been trying this product for the last 30 days, Amazing results I strongly suggest giving it a try. I ordered a few more bottles as gifts to my friends, what better gift then to help out in someone’s health! in a normal level,I will recommend this all natural supplement to give it a try. Finally there is a product that is just healthy for me and does the job just fine. I have been on this Diet supplement for 10 days and found I am sleeping better have more energy and lost 3 lbs, it is great. Would recommend it to all who would like to try it, a must!!!.. I tried these supplements on the advice from a good friend of mine who swears by them! I have been on them for 2 weeks now and I honestly do feel better and seem to have more energy. I am going to weigh myself at the end of the month and hoping for some results there as well. Being pre-diabetic I am concerned about my blood sugar and I think that this stuff will help me … naturally!